Some occasions come around all the time, like Truck Month, which according to those commercials lasts All. Year. Long. 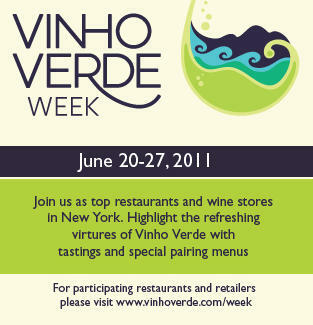 For a more rarified event, experience Vinho Verde Week: a seven-day wine celebration running from June 20th to 27th. This distinctly-crisp, crazy fresh wine is produced in one of Europe's oldest demarcated wine regions: the eponymous Vinho Verde, located in Portugal's Northwest, which unlike America's Northwest, hasn't completely abolished gears that haven't been fixed. During the magical week, drop by participating wine shops offering free tastings and discounted bottles, then enjoy Vinho Verde from the comfort of your own home. Or, sample the inspiring elixir at NYC's premiere restaurants, who are marking this glorious week via custom menus that pair appropriately buoyant dishes with the wine whose summer-ready vivaciousness is the exact opposite of the uber-intense Vinho Diesel. For zero APR and no money down, scope the full list of restos and wine shops partaking in Vinho Verde Week, right here.